Mar 28 Convention Connection: @Cryptozoic Is Headed To #Wondercon 2017 And Have A Few Goodies For You. DC Bombshells Vinyl Figures — Based on the highly popular DC Bombshells line of comics and collectibles that place female superheroes at the center of World War II, these 7-inch vinyl figures of Wonder Woman, Harley Quinn, and Catwoman each come packaged in display-worthy window boxes that show off the impressive level of detail and eye-catching attitude. Inspired by pin-ups from the 1940s, the figures were designed by Pedro Astudillo and sculpted by Anders Ehrenborg. DC Bombshells Pennants and DC Bombshells Bottle Opener Keychains will also be available. Mighty Meeples — First appearing over 15 years ago, the "meeple"—short for "my people"—possesses a distinctive shape that has made it a popular choice for player pieces in a variety of tabletop games. Cryptozoic’s first Mighty Meeples releases showcase fan-favorite DC Comics characters. Mighty Meeples: DC Series 1features thirty distinctive figures for heroes like Batman and Superman and villains such as Harley Quinn. The Mighty Meeples: DC Hall of Justice Collection resembles the Hall of Justice and holds the seven included figures. In addition, the Mighty Meeples: Ghostbusters Collection comes with Ghostbusters figures and a tin resembling their iconic vehicle, the Ecto-1. 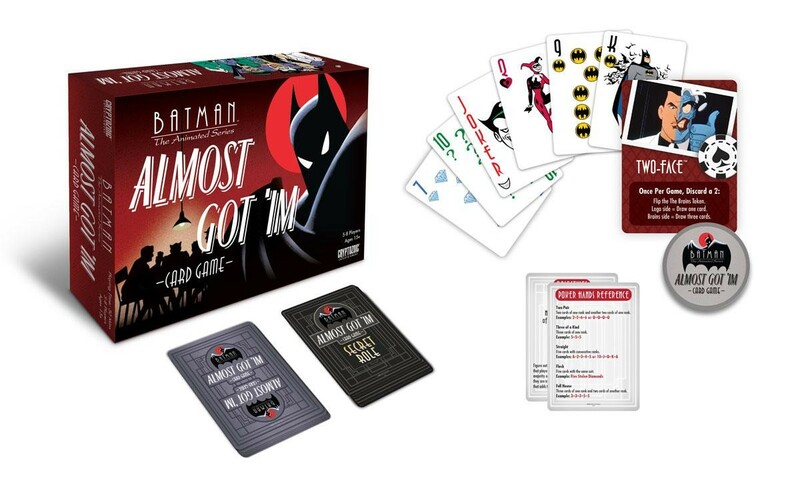 Batman: The Animated Series Almost Got ’Im Card Game — In this 5-8 player social deduction game based on the classic “Almost Got ’Im” episode of Batman: The Animated Series, players become various Villains of the Caped Crusader, one of whom is secretly Batman in disguise. 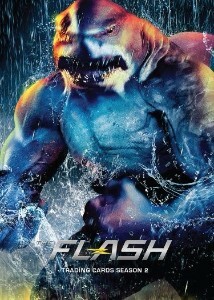 Participants gather cards to form poker hands that activate special abilities, as the Villain players try to find out which one of them is Batman and the Batman player tries to Subdue the Villains before they discover his or her true identity. 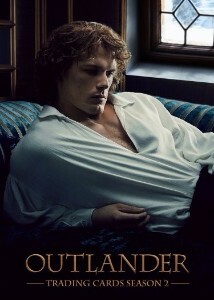 In addition, Cryptozoic will be giving away three different Promo Cards at its booth: DC Bombshells Trading Cards Promo Card P1 (depicting a retro-style Supergirl), The Flash Trading Cards Season 2 Promo Card P2 (showing the villainous King Shark) and Outlander Trading Cards Season 2 Promo Card P3 (showing the heroic Jamie Fraser). Are you headed to Wonder Con? Let us know in the comment section below.